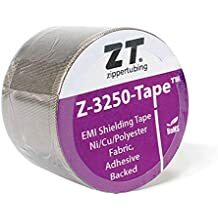 Connector Cover Shielded - Shielding Tapes And Wraps - Emi Shielding - Products - ZT | Zippertubing Co.
Shielded Connector Covers consist of a .010" thick high-temperature PVC jacket (Mil-I-631D, Type F, Form S, Grade C, Class 1) laminated to an SH1 Aluminum foil EMI shield, with a 15 AWG drain wire and an R-Track thumb pressure closure. The covers come in five standard trapezoidal shapes that are intended to enclose and EMI-harden a mated connector pair. When used in conjunction with Zippertubing's SH1 and 63-10 cable jacketing they can create a fully EMI-hardened cable assembly. The Connector Cover™ may also be cut to form tapered cone shapes that can carry the EMI shield over a connector mated to bulkhead or panel. 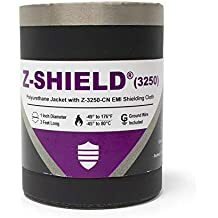 The SH1 EMI shield provides excellent shielding performance. The covers are flame-retardant, have good fluid resistance properties, and have an operating temperature range of -20° to 105°C (-4° to 221°F).